For a special birthday treat my parents took us all out for a fancy afternoon tea at Pontlands Park this weekend. We usually go out for dinner whenever it is one of our birthdays but this year what I really wanted was for us all to go for an afternoon tea and also to not have to organise anything myself! Fortunately for me my lovely Mum planned this as a surprise for me, inviting my Dad and his girlfriend, my stepdad and brother and of course my boyfriend who was charged with bringing me to the secret destination! I've never been to Pontlands Park before, but as we pulled up in the car it looked the hotel looked beautiful set in between the fields and I was really excited. As we stepped in we were shown to a separate function room away from the main restaurant which was beautifully decorated and elegant. We ordered three Afternoon Tea stands to share between us and were quickly given our teapots, sugar bowls and milk jugs as well as additional coffees and juice for the sacrilegious non-tea drinkers! When the three-tiered cake stands arrived they were full of goodies. The first tier had finger sandwiches including ham, cucumber, cheese and salmon on white and brown bread with a small jar of Tiptree wholegrain mustard. The sandwiches were simple but very tasty, I'm not a fan of fish or seafood so I skipped my salmon sandwich and I didn't try the mustard but I was very pleased with the selection we were given. There were also enough for four sandwiches each which I think was a perfect amount. 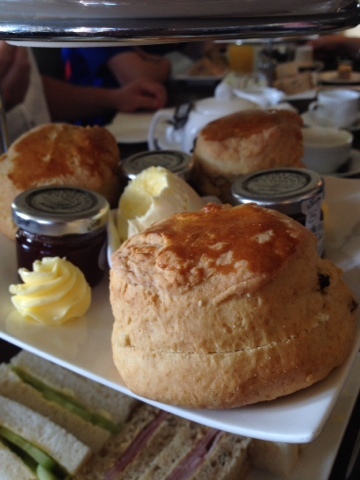 The second tier included fresh warm sultana scones with little swirls of butter, individual jars of Tiptree strawberry jam and a pot of clotted cream to share. The scones were delicious, they were so warm inside that the clotted cream melted straight in to the scone so instead of following by my family's example I put my jam on first and my clotted cream on second. Apparently this is the Cornish way to make a cream tea, whereas Devon put the cream on first followed by jam, this caused us all to debate on which is the best way to do it! I side with Devon usually, but in this case I didn't want the cream to melt! We also all felt that we could do with a bit more cream as sharing the pot between us didn't seem to go very far - we asked for another pot which of course left us with an overload of clotted cream which Harry decided to use up with the rest of his desserts. The final tier offered us a selection of cakes and desserts. The shot glasses were filled with layers of raspberry compote, raspberry mousse and were finished with a raspberry on top. I find raspberries to be a bit sharp so I offered mine to Harry in exchange for one of his cakes! The cake with whipped cream, meringue and fruit on top was a lemon drizzle slice. While all the elements were delicious I'm not sure how well they worked together, perhaps a separate mini meringue would've worked better than placing it on top of the cake. The last desserts were mini slices of carrot cake which is one of my favourite cakes to have especially with a cup of tea! By the end of the afternoon tea we were all stuffed despite many of us not eating all of the cakes or sandwiches! 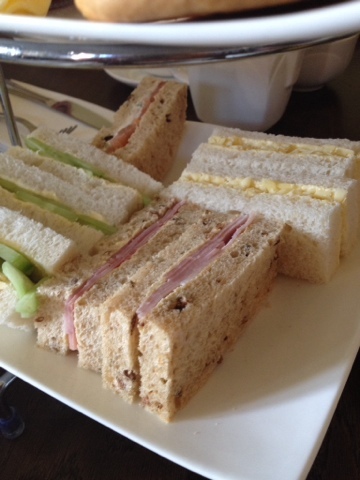 We were all very satisfied with the selection of sandwiches and cakes and were offered plenty of tea to go with them. The service was friendly and unobtrusive once we were presented with our food we were left to enjoy it and relax. At £13.95 each it could be a bit pricey but no more so than going out for lunch at a restaurant and it certainly cost less than going out for dinner. If it weren't a special occasion, or a very special treat, Harry and I probably wouldn't go again but only because we prefer cheaper days out and if we were going to spend £30 between us we would put it towards going out for dinner instead. Overall I was impressed with Pontland park, the food was exactly what I would've wanted if I had planned the afternoon tea myself, it was delicious and the surroundings were beautiful. It was also really nice to spend some quality time with my family all in one place as that doesn't happen very often! Does anyone else have a recommendation for places that do Afternoon Tea? 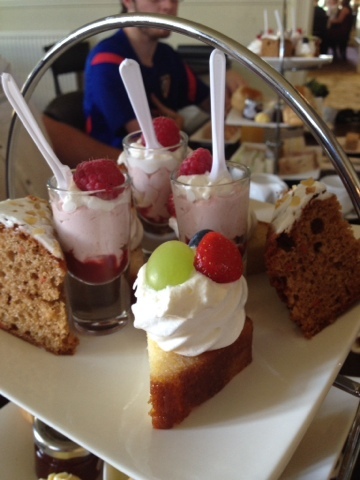 What would your top Afternoon Tea include?